ADA5000 Automatic Distillation Analyzer – Koehler Instrument Company, Inc. The sample is evaporated and condensed under controlled conditions, and observations are made of the temperatures at which various percentages are recovered and/or the percentages recovered at specific temperatures. The Koehler Automatic Distillation Analyzer is designed to perform optimal distillation analyses of gasolines, fuels, oils, solvents, aromatics, napthas, kerosenes, hydrocarbons, and other volatile products to ensure conformity to rigid quality control standards. The analyzer automatically performs tests, processes results, and produces standard reports according to ASTM, ISO, and related specifications. Receiver Chamber Heating System-The receiver chamber heating system is ideal for samples that form waxes or other solids during distillation. Dry Point Detection as Standard Feature - Dry point can be detected visually or by automatic detection for ASTM D850 and D1078 test methods. The unit is delivered ready with the PC board components already included as standard to perform the dry point analysis. 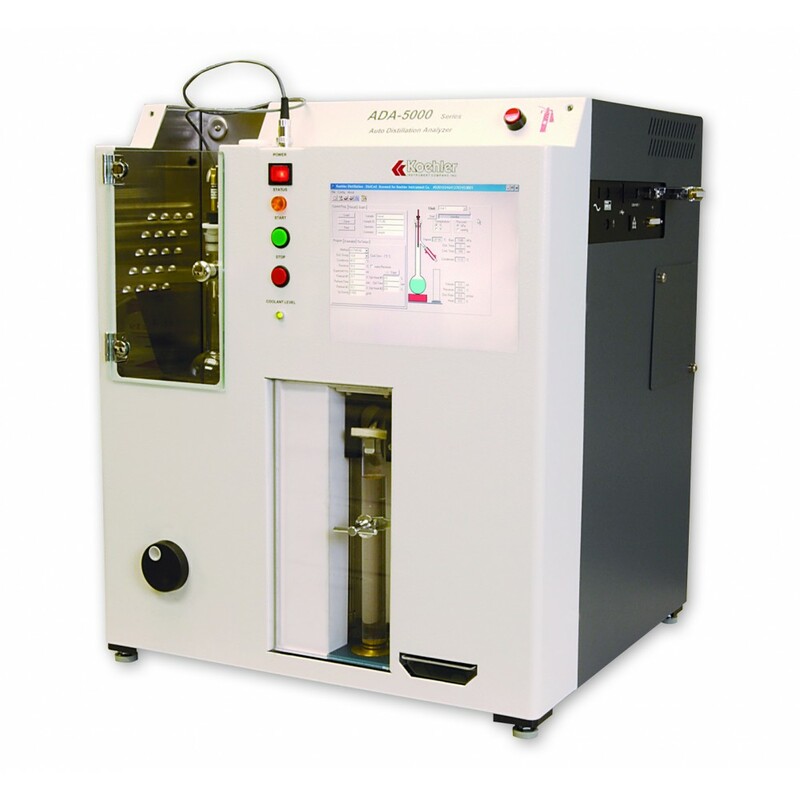 Simply order the Automatic Dry Point Detection Kit for Solvents (see Ordering Information at right) which includes dry point thermocouple, 200mL flask and PTFE plug to perform dry point detection analysis automatically. Ready for Groups 1 - 4 and more - Each Koehler Automatic Distillation Analyzer 5000 Series comes ready with the equipment, accessories and features as standard to properly run distillation groups 1 to 4 per ASTM D86 and related test specifications. No additional accessories are required. The Windows®-based software package allows simple operator selection of the programmed settings for each distillation protocol. No complicated routines are needed to set up the unit. User defined programs are easily created for customization of the analyzer. Calculated Cetane Index - Calculated cetane index is a useful tool for estimating ASTM D4737 cetane number where a test engine is not available for determining this properly. It may be conveniently employed for approximating cetane number where the quantity of sample is too small for an engine rating. In cases where the cetane number of a fuel has been initially established, the index is useful as a cetane number check on subsequent samples of that fuel, provided its source and mode of manufacture remain unchanged. The Cetane index is automatically calculated at the end of the test if all the necessary variables are entered and is a component of the Windows®- based software which comes standard with the unit. Carbon Residue on 10% Distillation Residue - As per section 10, ASTM D189 the procedure for carbon residue of light distillate oils can be performed. Dry Point Detection: Automatic dry point detection board is included with standard equipment and only requires a dry point sensor, 200mL flask and PTFE plug for ASTM D850 and D1078 tests.